Traditional roller coasters use chain lifts to transport their trains to the top of their lift hills. From there, gravity takes over. A subset of coasters, however, replace chain lifts with various launch mechanisms. Instead of building anticipation for the first drop, many of them blast out of the station from a standstill to face-melting speeds in mere seconds. (In fact, the world's fastest coasters are all launched coasters.) A few of them are more poky. Some incorporate multiple launches throughout the course of the ride. Magnetic launch: Positive- and negative-charged plates in the train and on the track repel one another to rev the train up to speed. There are two basic types of magnetically launched coasters: ones that use linear induction motors (LIM) and ones that use linear synchronous motors (LSM). Most launched coasters use one of the two magnetic systems. Examples of magnetically launched coasters include the wonderful Cheetah Hunt at Busch Gardens in Tampa and Sky Rocket at Kennywood in Pennsylvania. C​ompressed air launch: You know those drop tower rides at amusement parks that shoot up from the base to the top of the tower (and then freefall back down)? Many of them use compressed air systems to launch the ride vehicles. The concept is the same on compressed air launch coasters. Instead of shooting a ride vehicle up a tower, they use compressed air to launch a coaster train along the tracks. An example of a compressed air launch coaster is Powder Keg at Silver Dollar City in Missouri. Hydraulic launch: Powerful hydraulic motors use hydraulic fluid and compressed nitrogen gas to launch some of the fastest coasters in the world. Examples of hydraulic launch coasters include Xcelerator at Knott's Berry Farm in California and Storm Runner at Hersheypark in Pennsylvania. Tire propelled launch: Some coasters use tires mounted in the track to boost their trains. The popular Incredible Hulk at Universal Orlando's Islands of Adventure is an example of a tire propelled launch coaster. Although it hits a potent 70 mph, Maverick doesn't come close to being the fastest coaster at Cedar Point in Ohio. And at 105 feet, it's downright puny among its behemoth coaster mates. But its twin LSM launches, crazy-steep 95-degree first drop, incredibly smooth ride, inspired layout, delicious airtime moments, and great location overlooking Lake Erie help make it one of Cedar Point’s best coasters as well as one of the best coasters anywhere. ​Located at Six Flags Great Adventure in New Jersey, Kingda Ka shattered records when it debuted in 2005. Using a hydraulic launch system, it hits 128 mph and climbs 456 feet up a top hat tower. It has since been eclipsed as the world's fastest coaster, but still holds the record as the world's tallest. The ride is over in less than a minute—but should you dare to board the thrill machine, it would be a minute of your life you wouldn't soon forget. 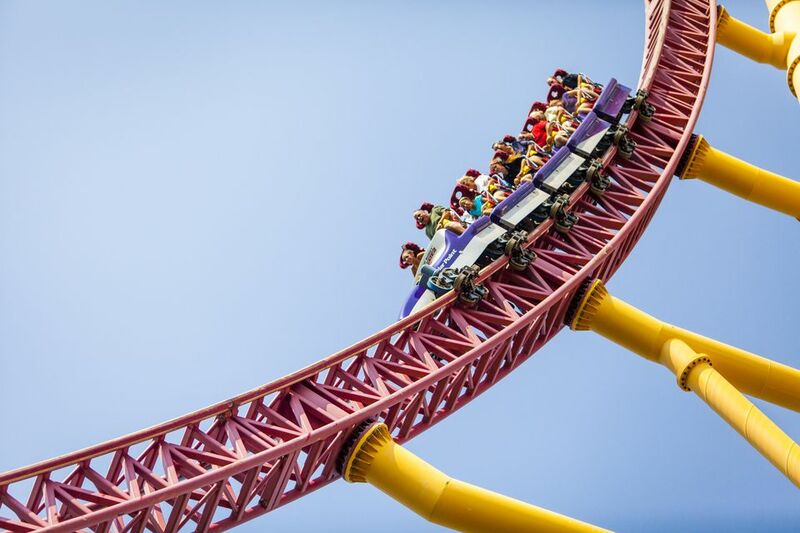 The essentially similar "rocket coaster," Top Thrill Dragster at Cedar Point in Ohio, soars 420 feet and hits 120 mph. Those stats qualified as world records until Kingda Ka shattered them when it opened a couple of years later. Top Thrill Dragster generally provides a smoother ride experience than Kingda Ka. For obvious reasons, both of the rides make it to the list of the scariest coasters in North America. When it opened at Six Flags Magic Mountain in California, Superman was the world's first coaster to hit 100 mph. Known as a shuttle coaster (which retraces its steps on a fixed section of track rather than completing a full circuit like a traditional coaster), LSM motors blast single-car trains backwards up its 415-feet tower. Passengers experience over six seconds of weightlessness before the trains plummet back down the L-shaped track. Also located at Six Flags Magic Mountain, Full Throttle uses LSM motors to scream out of the station at 70 mph and tackle a 160-foot loop—one of the world's tallest on a coaster. A second LSM launch sends the train racing backwards, while a third launch propels it forward for another go at the 160-foot loop. The world's best launched wooden coaster (granted, it is the world's only launched wooden coaster) is Lightning Rod at Dollywood in Tennessee. It uses LSM motors to race 45 mph up the lift hill. Lightning Rod then hits 73 mph on its first drop, making it the world's fastest wooden coaster. It is the best coaster at Dollywood, although the park has plenty of other worthy contenders. Combination dark rides and roller coasters, the Revenge of the Mummy attractions at Universal Studios in both Orlando and Hollywood use LIM motors to crank up the speed for the second half of the experiences. For the first half, "SLIMs" or slow LIMs moderate the speed of the ride vehicles so that passengers can experience the animatronics and other special effects. The Florida version is better than its California counterpart. Not all launched coasters deliver extreme thrills. FireChaser Express at Dollywood only hits a top speed of 35 mph, has a low height restriction of 39 inches, and is geared to a more inclusive family audience. It uses a tire propelled launch out of the station and then uses a chain lift to climb its lift hill. It makes a pit stop in a fireworks testing shed. Before the shed and the trainload of passengers go kablooey, a second tire propelled launch sends the train racing backwards and back to the station.